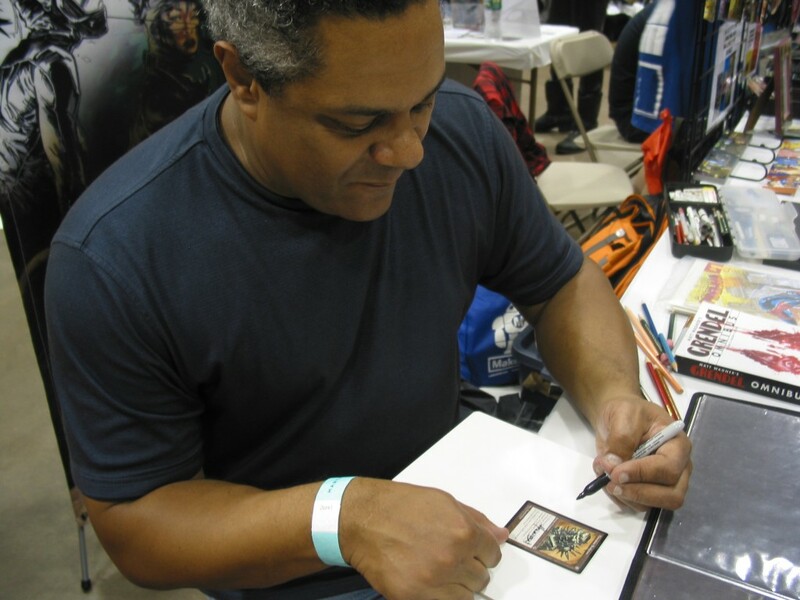 It’s just before noon on Saturday, Sept. 19, when a fan approaches Hannibal King’s booth at Hartford Comic Con holding a box of Magic: The Gathering cards. Asking if he will sign a stack of about 20 cards bearing King’s artwork, the fan hands over a number of Goblin Tinkerer and Fifth Edition Counterspell, among several others. King happily takes the cards and lays them out four at a time so he can scrawl his all-caps signature “HANNIBAL” on them in black ink. He works with the efficiency of an assembly line, trading quips with the fan while waving each card to ensure that the ink is dry. This kind of adaptability isn’t unusual for King, a more than 20-year veteran of the comics and gaming industry. Able to transition between both mainstream and independent comic titles, King has built a career illustrating both iconic characters and lesser-known gems, like Dark Horse’s Grendel. Hannibal King signs cards for a fan at Hartford Comic Con. Still, it was relatively early in his working life that King had the opportunity to begin working for Wizards of the Coast, a fortuitous confluence of events that came about because his mentor — the legendary illustrator Rick Berry — was too busy to take the job himself. “He was literally overrun with work, and he said, ‘Give the kid a shot!’ And the next thing I knew, I was on the Mirage [set],” said King with a deep laugh. In between booming announcements from the convention’s PA system, King related what it was like to work with Art Director Maria Cabardo, whom he described as “awesome, period,” and what the process was like whenever he received a card assignment. First, he would get a 30-or-so page outline of the set’s overarching theme and story, a document comprised of both text and preliminary sketches. King said he would often “take the text and throw it over my shoulder” in favor of immersing himself in the visual elements. Then he would take off running. King’s entrance into the stable of artists at Wizards of the Coast was fortuitous for another reason as well: It came at a time when Magic’s designers were actively trying to add more diversity to the game. Set on the continent of Jamuraa, which was modeled after Africa, the Mirage set broke from the clichéd Anglo-Saxon fantasy milieu in favor of powerful wizards with dark skin. Suddenly, players from racial minorities had characters that looked like them on the cards. Suddenly, King was able to draw fantastic wizards, warriors and enchantresses that weren’t just Caucasian — like the powerful (and powerfully rendered) sorceress depicted on the Mirage printing of Healing Salve. 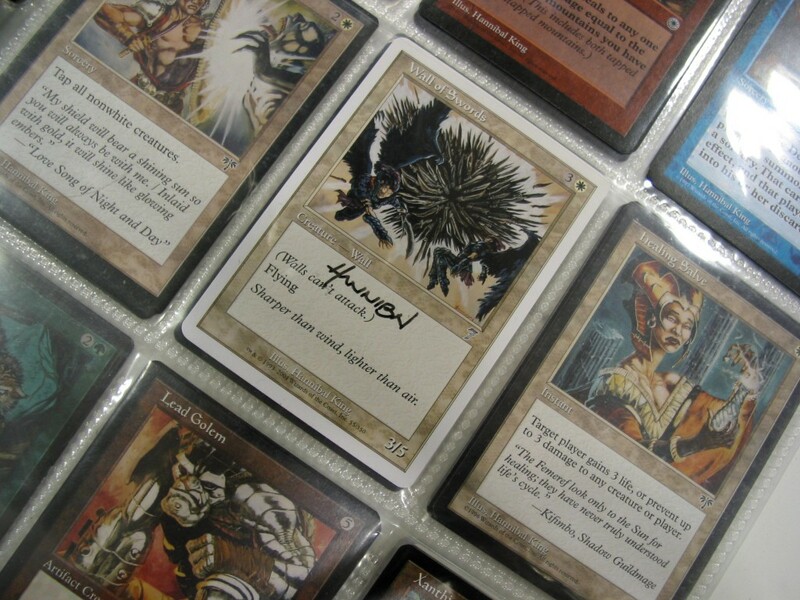 Artist proofs bearing King’s signature are seen in a binder. King illustrated 27 cards for Magic: The Gathering. “The world isn’t a set place, isn’t a set box. There are so many different aspects of life in general that you can’t have an interesting set of cards unless its diverse,” said King. After ending his initial tenure with Magic: The Gathering (more on that in a minute), King went on to work for other card games and RPGs, including BattleTech and Netrunner. He also worked on multiple comic titles, like Marvel’s Excalibur and DC’s Green Arrow, as well as book covers. Describing himself as “a guy in a studio,” King also continues to produce the large traditional paintings for which he’s become known, including client commissions and personal works. But the best news of all is that King is expecting to return to Wizards of the Coast to produce more card art. Details are still under wraps, but it’s possible that players will once again hold King’s artwork in their hands in the coming year or two. The significance of coming full circle isn’t lost on King, and he’s excited to return to the company that “gave the kid a shot” more than 20 years ago.